You’ve most likely heard by now that the New SAT has come out with changes that many are surprised are possibly making the test easier. In particular, some are saying the reading comprehension section is less difficult than before. However, despite all this “rhetoric,” most students aren’t prepared for the Reading Comprehension section for the exam many top colleges still require for admissions. As a result, we at SanLi have decided to share some of our secrets for the general community out there on how to prepare for possibly the most challenging part of the exam. Have you heard of David Coleman? 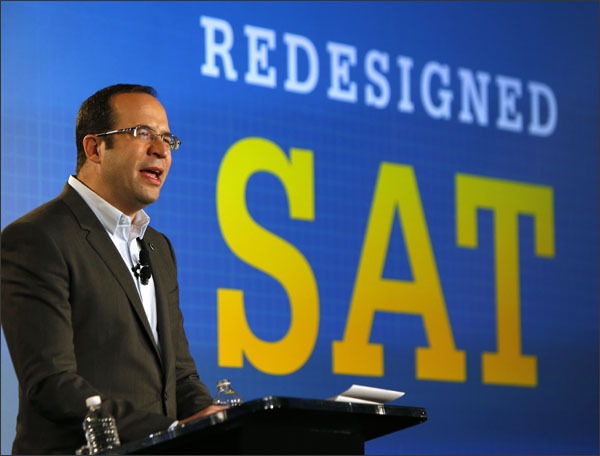 Besides graduating from an Ivy League University, there is a bit more about the man you should know about to understand more about the changes to the SAT. In 2009 the National Governors Association and the Council of Chief State School Officers launched an initiative to write Common Core State Standards for elementary through high school English Language Arts and Mathematics. The Common Core State Standards aim to prepare students for college and careers by identifying the skills students should learn from kindergarten through high school. David Coleman was on the English Language Arts writing team, which was chaired by Student Achievement Partners co-founder Sue Pimentel. Coleman’s friend and Student Achievement Partners co-founder Jason Zimba was a leader on the Mathematics writing team. As of June 2014, the standards have been adopted by 44 states. Other states have not adopted the standards, or have adopted them temporarily then later backed away from adoption. Yes, David Coleman was a huge part of the Common Core. On top of that, if you pay attention closely to the “Common Core,” you’ll see many things you’ve been told about the New SAT originally mentioned by the standard many U.S. States have adopted into their curricula. The standards include certain critical types of content for all students, including classic myths and stories from around the world, foundational U.S. documents, seminal works of American literature, and the writings of Shakespeare. First of all, we’ve been devising an incredible curriculum around much of the content a year before the exam was released. Our “founding documents” curriculum is second to none. It may be why many of our students have scored above 1500 on the new exam. Virginia Woolf, Three Guineas. ©1938 by Harcourt, Inc. If you need more ideas, come by to our center and we’ll give you more recommendations. We will be happy to help you with our SAT Courses or even just a quick conversation about the new exam.